It is important that when contacting a Borzoi breeder that you express health concern issues and ask the breeder what they are doing in order to help mimimize them. Please don't purchase your Borzoi from a petstore which commonly are known to support Borzoi puppy mills. Doing so only promotes inproper breeding ethics and promotes current Borzoi health issues. The AKC, UKC, FCI, CKC, SKC, WWKC, FIC registries recognize the Borzoi breed standard. Country of Origin: USSR; developed in early 17th century from Arabian Gazehounds and native coated breeds. These large tough hunting dogs were gentle in temperament and exotic in appearance. . 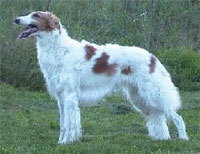 Character: The Borzoi is proud and loyal to its family. It is also known for being calm and independent. Temperment: This dog is not fond of strangers. It gets along well with children but is not an ideal playmate. Coat: Coat is soft, and consists of medium-length wavy hair. Care Coat needs regular grooming. Excess hair between pads of the feet must be trimmed. Comments: Indoors they are graceful and dignified, leaving no havoc behind them, despite their great size. Their calm demeanor and nobility make them a attractive pet for those with enough room. .